(b. Havana, Cuba, 1928; d. Paris, France, May 25 2001). 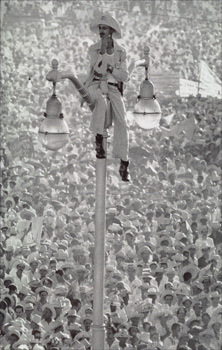 Born Alberto Diaz Gutierrez, but better known by his nickname "Korda," is Cuba’s most well known photojournalist. He began his career as a fashion photographer. In 1953, he co-founded Korda Studios and was the first person to photograph Cuban fashion worn by Cuban models. Korda and his favorite model, Norka were eventually married. At the victory of the Revolution, he began working for the newspaper Revolución. From these earliest days he became Fidel Castro's official "chronicler" or photographer, until 1968, accompanying him on his numerous visits overseas, including visits to Venezuela, United States, the Soviet Union and other countries. His photographic technique then used the same idea and techniques as in fashion photography, including the use of only natural light, a fundamental characteristic of his entire career. He later took up underwater photography and established an underwater photography department at the Science Academy in Havana. Best known as the creator of one of the most reproduced images in the world, the iconic image of Che Guevara "Guerrillero Heroico" of 1960, Korda leaves behind an incredible body of work and historical records. In this 2001 interview conducted in the home of gallerist Darrel Couturier, curator Bill Kelley Jr interviews Korda a few weeks before his passing in Paris. They speak about the current art scene in Cuba, particularly his interest in contemporary photography and his love of fashion photography.